MILLBRAE, Calif. — A Facebook executive is demanding answers after her brother died in a police encounter south of San Francisco this month. 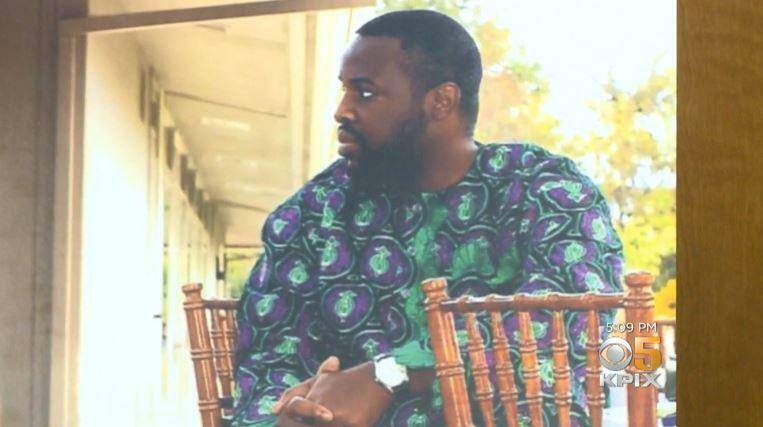 Ebele Okobi told USA Today that her brother, 36-year-old Chinedu Valentine Okobi, suffered from mental health issues and was unarmed when he died Oct. 3 after being repeatedly Tasered by San Mateo County Sheriff's deputies. Ebele Okobi, Facebook's director of public policy for Africa, told USA Today that she wants to know whether the deputies were trained in crisis intervention for people struggling with mental illness, and why they continued to Taser her brother rather than call for medical help. The incident occurred less than 20 miles from the Silicon Valley headquarters of the technology giant, and Ebele Okobi, who is African American, told the paper she has received an outpouring of support from her colleagues there. "I think this has helped people who aren't African American and who aren't in the African American community recognize that this is something that every black person faces," Okobi, who lives in London, told USA Today. "I definitely think within Facebook, for a lot of my friends and my colleagues, there has been this realization and this recognition that this is a significant national problem." The sheriff's office said in a news release that Okobi was running in and out of traffic on a busy thoroughfare in Millbrae when a deputy first encountered him around 1 p.m. that day. San Mateo County District Attorney Stephen Wagstaffe, who is investigating the death, told CBS News the deputy approached Okobi because he was worried about his safety. He said Okobi resisted officers, and when they couldn't gain control of him using their hands, two deputies deployed their Tasers. Okobi was Tasered between three and four times, Wagstaffe said. Wagstaffe said Okobi was taken into custody, but quickly went into cardiac arrest. He was rushed to a hospital, where he was pronounced dead. A news release from the San Mateo County Sheriff's office said Okobi "immediately assaulted" the first deputy, who radioed for assistance, and that's when more deputies responded. The release said no gunfire was used, but made no mention of a Taser. It directed media inquiries to Wagstaffe. Wagstaffe said there was a physical altercation between Okobi and the officers, but said he wouldn't characterize it as an assault and wanted to first review evidence. Wagstaffe said there are multiple videos of the incident including dashcam video, surveillance video and bystander cell video, though none capture the entirety of the incident. The sheriff's office does not yet have body cameras, he said. John Burris, a prominent civil rights attorney who is representing the Okobi family, told CBS radio affiliate KCAL that officials' account of Okobi's behavior "is not a death warrant." "If in fact he was walking in the manner which has been reported, then that might suggest there was a mental problem taking place," he said. "If that's the case, then the officers should have been properly aware of such and treated him differently than a felony suspect." Burris said if the Taser was used improperly, that should merit criminal prosecution for the officers, who are currently on paid leave. The family is also calling for the public release of all video. Wagstaffe said he hopes to release video of the incident within 45 days, but said he would share the video and any other information with the family before making it public. "They are entitled to that as a grieving family, and I grieve for them," Wagstaffe said. "It doesn't matter how it came about, this family lost a loved one." Wagstaffe said he met with the family Wednesday morning, and understands that they want answers. He said he's investigating whether the deputies committed a crime by using excessive force. His office is awaiting more information from the medical examiner's office to determine whether the Taser played a role in Okobi's death. Ebele Okobi told USA Today that her brother, who was a father and graduated from Morehouse college with a degree in business administration, was diagnosed by one psychiatrist as bipolar and by another as schizophrenic. He held down a job, attended church and wrote poetry, Okobi said. He was managing the condition until December or January, she told the paper, when Okobi said she feared her brother stopped taking his medication. The paper reports that a service was held for Chinedu Okobi at the San Francisco Christian Center Tuesday and was attended by several Facebook executives. A Facebook fundraiser benefiting the Equal Justice Initiative in Okobi's memory describes him as a "person, a son, a little brother…. and a father. He was loved. He was also an unarmed black man with mental health issues who committed no crime. Remember his name. Black Lives Matter."